The Assembly Labor and Employment Committee will consider two California Chamber of Commerce-opposed bills that would add another layer of burdens on employers and their ability to manage their workforce. AB 628 (Bonta; D-Oakland) significantly expands the definition of sexual harassment under the Labor Code, which is inconsistent with the definition in the Government Code, which will lead to inconsistent implementation of anti-harassment policies, confusion, and litigation. Also, provides an unprecedented, uncapped leave of absence for victims of sexual harassment and their “family members,” which is broadly defined, that will add another layer of burdens on employers and their ability to manage their workforce. AB 1224 (Gray; D-Merced) Unduly burdens and increases costs on employers by mandating they provide an additional three-month protected leave of absence from work for family medical leave, that could total over 6 months of leave for an employee, and exposes employers to costly litigation for any alleged violation. CalChamber is opposed to AB 628 because the bill would create inconsistent definitions of sexual harassment under the Labor Code and Government Code, impose an unlimited leave of absence on employers for employees and their family members, and impose another pathway for costly litigation against employers for issues that are already protected under the Fair Employment and Housing Act (FEHA). Although the CalChamber supports efforts to eliminate harassment in the workplace, this proposal will create significant challenges for employers to manage their workforce and comply with existing anti-harassment requirements. AB 1224 creates a new leave whereby an employee needs to work for an employer only for 900 hours in the 12 months before taking leave. This would expand the amount of protect leave and employer must grant to half a year. Impose Additional and Overwhelming Costs on Employers. Even though the leave under AB 1224 is not “paid” by the employer, that does not mean the employer will not endure added costs. While the employee is on leave, the employer will have to: 1) maintain medical benefits; 2) pay for a temporary employee to cover for the employee on leave, usually at a higher premium given the limited duration of employment; or 3) pay overtime to other employees to cover the work of the employee on leave. Expose Employers to Costly Litigation for Potentially Frivolous Claims. AB 1224 exposes employers to costly litigation under FEHA. An employee who believes the employer did not provide the 12 weeks of protected leave could pursue a claim against the employer seeking compensatory damages, injunctive relief, declaratory relief, punitive damages, and attorney’s fees. AB 628 and AB 1224 will be heard in Assembly Labor and Employment on April 3. 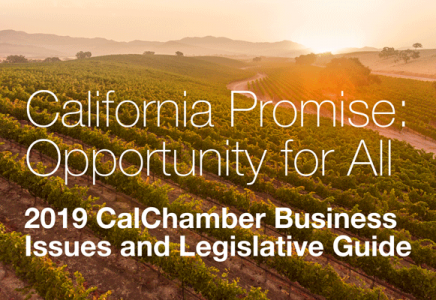 CalChamber is urging businesses to contact their Assembly member on the committee and urge them to oppose AB 628 and AB 1224. ← Will the Real Data Regulator Please Stand Up? PLEASE stand up? !